Is your property under attack by moss, grime, mildew, grease, algae and other pollutants? Does it look like it’s losing its curb appeal slowly but surely? It might be time for a pressure wash. You would be amazed by how much easily your property’s beauty can be restored with a perfectly executed power wash.
NICK’S Window Cleaning offers pressure washing services to the GTA. With over ten years of experience in the industry, powerful equipment, and dedicated technicians, we have the skillset needed for any cleaning job. We are fully insured and come with WSIB coverage, meaning your property is completely safe. Although it happens slowly, your property certainly gets damaged by moss, mildew, grime and other pollutants and contaminants. The key lies in getting rid of these as soon as they become apparent on your property. If you get the job done promptly, you can avert any possible damage and extend the lifespan of your property. We combine friendly technicians, affordable rates, and an exceptional work ethic to make sure you get your money’s worth without any hassle. Call us for an estimate to day! Your business is an important investment. We believe a clean environment can do your brand image some good, and your customers and employees alike will thank you for a sparking business environment. We have handled different project sizes in throughout the GTA, meaning we are equipped to get the job done no matter how large or small. If your property is particularly large, you will need industry grade equipment. NICK’A Window cleaning has all the necessary machines to offer pressure cleaning services Woodbridge residents can depend on. If you feel your commercial property could you a power wash, call us for an estimate. There is a lot more involved in delivering a great pressure wash. Apart from the right equipment, you need the right handling techniques. Attacking the dirt blindly can damage your property’s surface. You have to set the pressure just right or you risk stripping away material off your surface. Additionally, you have to know when to use chemicals in your water, and what type exactly. This depends on the nature of the pollutants. Moss and algae can be done away with by using powerful algaecides. We know exactly what to pick and when. In short, you can leave everything to us and only get a cleaned property when all is said and done. Why not try us today? Is your roof looking old and unappealing with all the mildew and moss covering it? Is your driveway stained and streaked with grease and grime? Your best option for a thorough clean is a power wash. While it won’t take ages to get it done, you will be surprised by how revitalised your property will be if you do things right. Pressure washing equipment is easily accessible. You can buy it at any good hardware store or you could just rent it. But that does not mean you should since the equipment can present serious danger to you and your property. Many people have wound up in hospital with injuries from high-speed jets of chemical-laden water. Here are three reasons why you should seriously consider getting a professional to do the job. It can be time-consuming: Pressure washing equipment can make short work of any cleaning task – but only in the hands of the experienced. There is a learning curve to handling the machine and on-the-job training might result in injury and damage to your property. Instead of taking forever battling your dirt, why not let the pros handle it in a flash and let you get back to your normal routine? Insurance coverage: Professional pressure cleaning companies come with bonding and insurance. Looking at how dangerous the process can be, it is important to have some cover in case anything goes wrong. Your insurance company however probably does not include any damage that might arise from your disastrous power-washing attempts. That is why, for the love of your property, your best bet is to leave the whole business in the hands of an insured pro. 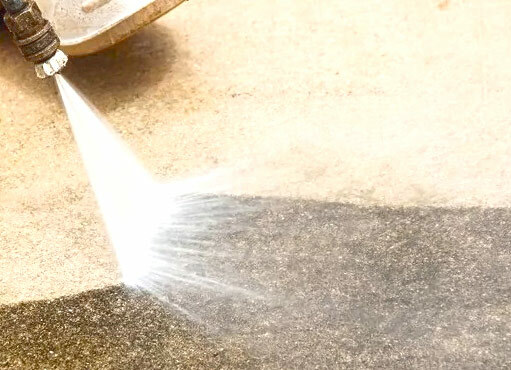 You won’t do a thorough job: There is so much more to power washing than simply pointing and shooting jets of water at dirt. The years of experience that professionals have mean your property can get a thorough cleanse with no corners untouched. It takes a systematic approach to deliver a thorough cleanse. You first need to conduct a complete assessment of the property to see what dirt is there and to what extent. Then you have to assess the type of material on the property to see how brutal you can let the machine get. 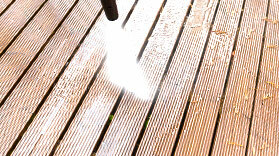 A well-oiled professional team of power washers means your property will get its sparkle restored in a short time. You can bet every inch will be cleaned. Save yourself the hassle of struggling with equipment that you are unfamiliar with. Call the pros, sit back, and relax!